The Corcovado National Park was established in 1975 to protect the landscape from rapid and uncontrolled deforestation and from destruction caused by sporadic digging by gold prospectors. For centuries the region had provided Costa Rican Indians with gold for their ornaments. In 1980, the national park again experienced a sort of gold rush when 3,000 illegal gold prospectors pushed their way into the protected area, stirring up the rivers, cutting down the trees, building campfires and digging up the earth. In short, they systematically damaged the environment. Six years after the beginning of the gold rush they were finally forced to leave the environmentally protected area. It is still occasionally possible to find an illegal gold prospector in the park, furtively sloshing water in a tin pan in search of gold nuggets. The 42,000 hectares of tropical coastal rain forest receive abundant rainfall year after year. The average annual precipitation in the area is 5,500 mm, fostering low forest growth along the coast and mountainous forest in the up to 750meter-high hills of Cerro Rincon. Stone cliffs, waterfalls and 50-meterhigh trees with trunks up to one meter in diameter characterize the landscape of the park. Many unique forms of vegetation have found their ecological niche in the humid region, and live with the help of host plants to which they attach themselves. 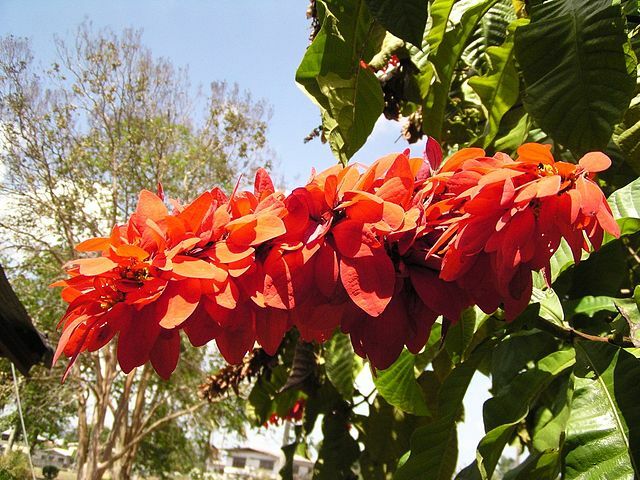 Lianas, bromeliads, hanging figs,orchids, staghorn ferns and other examples are found in the park. In the course of millions of years, Nature’s cycle has reached absolute perfection in the park. The moldy, damp humus soil sends off a strong odor in the tropical heat, which transforms all waste into fertile soil and provides nourishment for new generations of plants. The plants in turn feed a great many animals. There are 400 different kinds of birds, including brilliant red macaws that lend a touch of welcome color to the dark green background of the jungle’s thick vegetation. Harpy eagles (which have virtually disappeared elsewhere in Costa Rica) and hummingbirds are an integral part of the region’s ecosystem. The Corcovado National Park also provides an ideal habitat for the peccary, a mammal resembling the wild boar. Banded peccaries with bands of darker fur at their necks and white-bearded peccaries can reach a length of one meter and weigh up to a hundred pounds. They eat grass, leaves, roots, seeds, fruit and small animals such as frogs and reptiles. In the warmer season they feed only in the mornings and evenings and spend the remainder of the day sleeping in the shade, their own variation of the popular Latin American siesta. 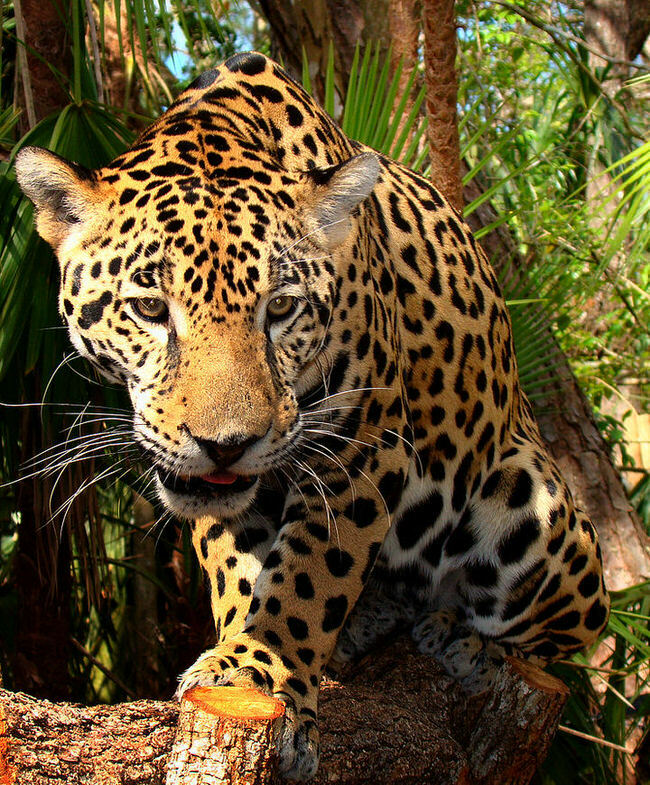 In addition to peccaries there are many other animals, including about 150 different mammals, such as ocelots, jaguars, long-tailed cats and coatis. 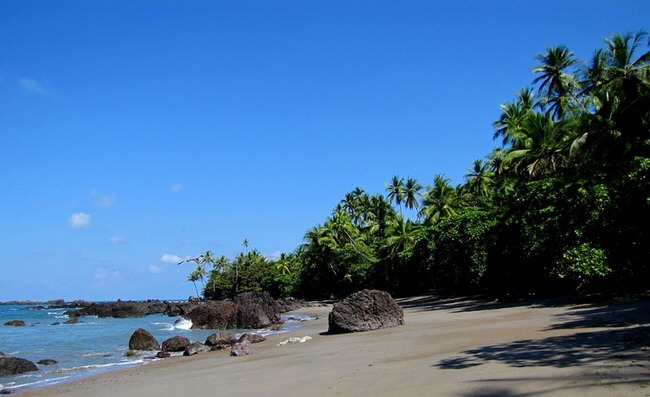 Near the lagoons of Corcovado and Buena Vista is a tidal zone characterized by palms and mangroves. Crocodiles are also around wherever it is warm and humid. Glass frogs, with their transparent skin, adapt very well to this damp environment. The rivers are filled with various kinds of reptiles and sea turtles. Even sharks have been seen near the coast, their dorsal fins high out of the water as they inspect the delicacies which the rivers have swept into the sea. Five forest stations provide information about Corcovado National Park. 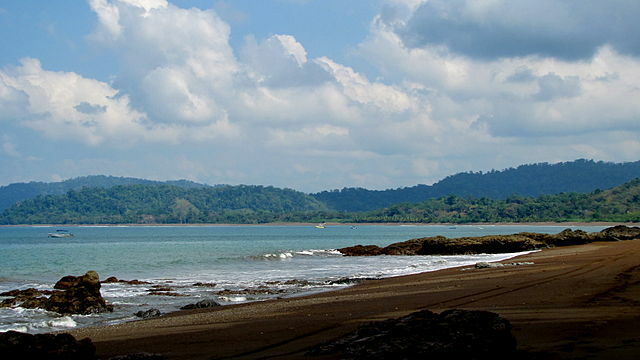 The park administration is in Sirena, south of Lake Corcovado near the small airport. The main entrance to the park is at San Pedrillo at the northwestern corner of the protected area.